Dearly beloved, Greetings to you all in name of our Lord and Savior Jesus Christ. Introduction: God is good! We are thankful to report that we had a fantastic week of VBS. God blessed the VBS-08 with more than two thousand children, and many children received Christ. When this vast number of children was given the opportunity to participate in the VBS 2008 at Nidubrolu Mission house, they were blessed by that wonderful experience. When different CLCI groups of children reach the CLCI campus, they feel like one family. After a lot of planning, organizing, budgeting and of course, praying, the VBS-08 Harvest was a wonderful success! We are happy to inform you that we had quite a few number of Hindu and Muslim children who participated in this VBS-08. We are sure that seeds were planted in quite few of those Hindu and Muslim children. The kids were enthusiastic, attentive and cooperative! It was awesome to see that many CLCI members also stepped up and helped with the VBS-08. We had been praying for 2000 kids for this VBS-08, and our Lord has answered our prayer. Even though there were bumps in the road, God gave strength and great success. Our annual VBS-08 was held from December 7th to 13nd, 2008. We had 200 to 250 new kids each day from different CLCI congregations and from other denominations also. For the final Saturday’s activities, we had 561 children. In total, during the seven days, 2016 children attended the VBS-08. This is approximately 856 more than last year and we had to prepare more materials and have them Xeroxed overnights. Evangelism: We are to let our ACTIONS MATCH OUR PASSION in other words, “Our actions show what we believe.” Keeping with its many years experience, the CLCI VBS continues to have the greatest evangelistic impact on many villages. 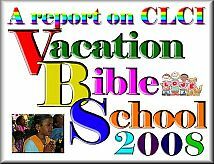 Increase of the membership in our CLCI churches is a direct result of VBS. We heard from our Pastor Johnson, from Chandole CLCI congregation, that one of the 2nd grade boys is still asking his mom to read the John Gospel to him. In a few days she read all John Gospel for her boy. This Mom is not a Christian, but rather a Hindu, and now is very interested now about Bible stories. She contacted our Pastor about these Bible stories. Our pastor informed us that she is now visiting our Chandole CLCI church on Sunday with her son. We are praying that soon or some day she will trust Christ as her Savior. With all the excitement about VBS-08, we expect next year’s numbers to continue to show VBS is reaching people like nothing else. In this VBS-08, we have taught our children to be passionate about “Let people know Jesus”! We are “to be witnesses to God in Jerusalem, and in all Judea and Samaria, and to the end of the earth” Acts 1:8. Programs: What a fine time we had! It was a busy week but well worth the effort. Our VBS motto for this year was “The fear of the Lord is the fountain of life. Proverbs 14.27” Besides the fear of the Lord, the participants in this year’s VBS learned to grow the fruit of their spirits – love, kindness, peace, joy and patience. The curriculum was well studied and inspired much creativity. This service provided an excellent environment for the children to provide music and singing during VBS programs. Kids sang along to the music of the CLCI Choir. Children were taught many number of traditional Sunday school songs “B.I.B.L.E. ; Rise and Shine, This is the Day, Jesus Loves Me” and more. As usual, our VBS-08 had activities like Bible education program, Bible quiz programs, Bible written tests, Bible story telling, Coloring of biblical pictures, painting plaques, songs competitions, crafts, music and games. The final day included wonderful games like musical chairs, skipping, ball games, caroms etc. and of course some fabulous food. Lessons: It’s always better to teach children as the grasp very easily and this VBS time is the right time to mould their minds towards Lord for making them a better person in future. In this VBS-08 children were taught the sweep of salvation history Creation, Covenant, Captivity, Christ, the Church and His Coming. One of the lessons that our VBS-08 taught to the children is “You are to love the Lord your God with all your heart, with all your soul, with all your strength and with all your mind, and your neighbor as yourself.” Luke 10:27. At VBS-08 kids discovered seven important ways God communicates with those who has the fear of the Lord and realized that each way communicates His amazing love directly to them! The children learned many other lessons, enjoyed being together, and finished up with a great cookout, a big meal on the last day. All this is possible because of your strong support. And your prayers to God are being answered in ways we will never fully know. Many children won the certificates, prizes and New Testaments for participating in various VBS activities. Finally everybody received a wonderful book of John Gospel with colored pictures on it. (We convey many thanks to Rev. Koenig for supplying these valuable books.) Thank you very much for all, which we have received from the U.S. As you know without your support it is impossible to conduct this type of massive VBS programs. Role of Orphans: There was also much help from the older orphans in receiving and making arrangements for the children and in looking after their needs, arrangements of tables, supply of VBS materials like books, charts, crayons, sketch pens, Sunday school material, picture books, Bible pictures, white papers, crayons, color pencils, pens, etc. It was amazing. Experiences of new children: I am happy to report that many of the participated kids were very responsive. There were several very surprised parents who commented on the good things there kids were doing at home. There were quite a few new Hindu and Muslim kids came together along with regular kids and enjoyed the week of activities. These following are some of their personal experiences they shared with our CLCI teachers. Prayer Request: We pray that His blessings may rest upon all the children that have been contacted through the humble and earnest endeavor of VBS-08. 1. Please pray for the coming VBS-09, pray for many Hindu and Muslim children to attend the VBS-09. Thanking everyone: On the last day we thanked everyone for their wonderful work. Also, we thank all the CLC-US children so much for their help. It is greatly appreciated. We never forget the help of our beloved CLC Sunday School partners, because God made it possible to have wonderful VBS this year also with the great help from them. Their prayer support and contributions have been building the CLCI children, so that in the future they will be prepared as God’s witnesses to influence their families and communities here in this darkened India. We also thank respected Mission Board very much for your sincere prayers and faithful support to the CLCI VBS ministry. Conclusion: All glory, laud and honor to Him alone. In our next VBS – 2009, we have a goal of reaching many more children, as we are concentrating more on new villages, tribal Thandas (groups). This goal can only be reached if all of us hold our hand together and move forward. God is providing for our needs now and is building our CLCI VBS ministry team more strongly. God is faithful! God did more than what we imagined! We pray that His blessings may rest upon all the children that have been contacted through the humble and earnest endeavor of VBS-08.